We’ve featured the work of Brett Foxwell on this site before, but the filmmaker’s latest stop-motion masterpiece, Fabricated, is extra-special and we’re thrilled to debut it here at Gizmodo. It’s a labour of love that took him 10 years to complete, a gorgeous sci-fi tale about a mechanical world trying to figure out how to evolve. Check out the film, then read on for an interview with Foxwell, as well as some images and video from the making of Fabricated. Gizmodo: How did you come up with Fabricated’s unique story, world, and characters? Brett Foxwell: This story came to me as I was starting to teach myself metalwork and machining. With access to a machine shop, the world of fabrication opened up to me. 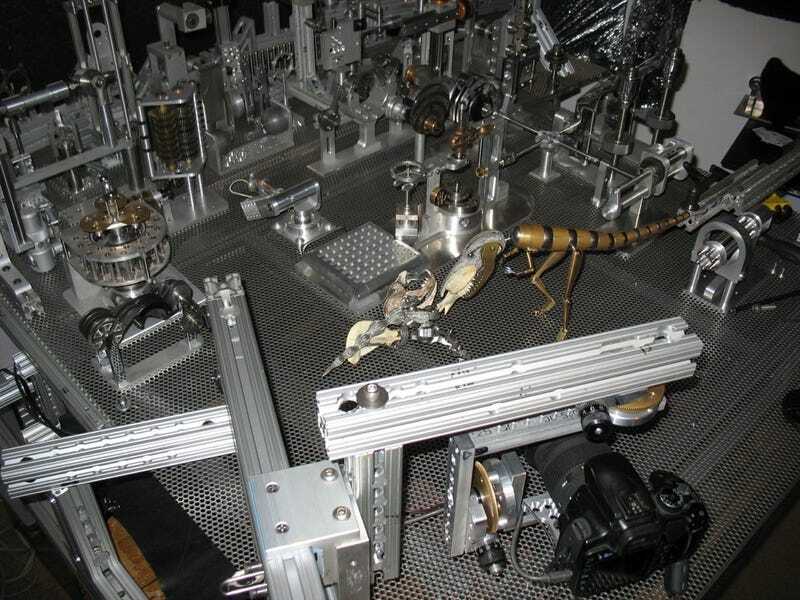 I began to dream of a mechanical world rebuilding itself and trying to imitate organic life with the skeletons, the machines, and the industrial aesthetic that we will leave behind. 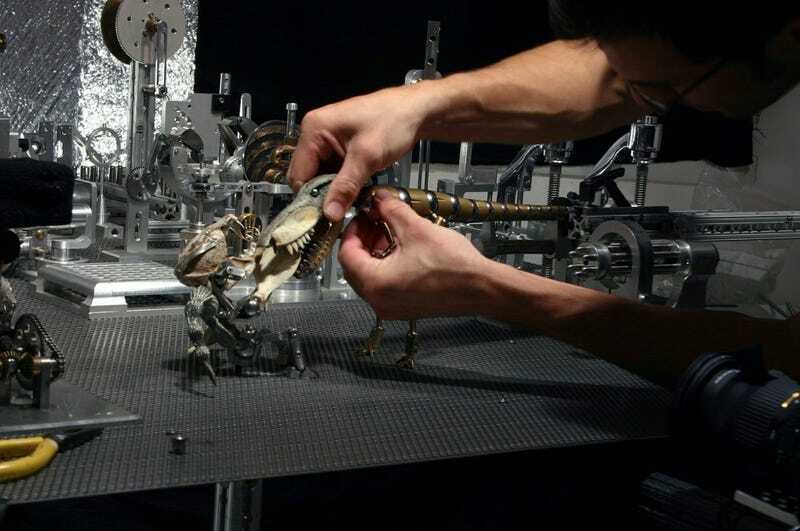 Creatures would be assembled from discarded parts and then released into this world. The film follows one of these creatures on its journey. There was also a universe of incredible stop-motion films that have inspired me over the years, including King Kong, The Valley of Gwangi, films by the Czech masters Jan Švankmajer and Jiří Barta, films of the Brothers Quay and The Secret Adventures of Tom Thumb. Films like these have a way of getting stuck in your subconscious and not leaving. Gizmodo: How did you get interested in stop-motion animation? Considering it’s such a labour-intensive process, what made you stick with Fabricated over the 10 years it took to complete? Foxwell: The medium of stop-motion animation has long fascinated me. It offers the means to build out and bring to life entirely new worlds and creatures, but demands ridiculous levels of difficult and tedious labour. Many times I would get completely burned out by the project, but while watching each shot after it was completed, I would be overwhelmed by the beauty of what I had just brought to life. That would keep me going. I had a full-time job as an engineer and machinist for much of the production, but this project was such a good creative outlet that I was happy to give it almost all of my free time. It also helps to have your own thing to design and write and dream about while you are working professionally on someone else’s project. Gizmodo: Filmmaking technology has obviously changed a lot over the past 10 years. How did that affect your process? When did you realise Fabricated was really, truly finished? Foxwell: I had shot my early animations on a movie camera with film. That is a great way to learn the discipline of animation because once you press the button, the frame is taken and that is that. Luckily, the first affordable DSLR cameras came out just in time for this project and digital capture offers a lot more freedom, for better and worse. The animation can be watched after each new frame was captured so I was able to adjust the creature’s performance mid-shot if the acting was off. I could also save a shot if something in the frame got bumped or knocked over. The downside of the digital camera and computer is that you can spend way too much time observing and refining the animation, and not know when to stop. Knowing when the film was really and truly finished was difficult because the world was so fully-realised near the end that I didn’t want to leave it. At some point, though, I had to just back away from it and call it done. I feel like the story of these characters has been told, but I have, against my better judgement, started my next 10-year animation project with all new creatures and alien landscapes. You can check out more of Brett Foxwell’s work — and keep tabs on his next stop-motion project — at his website.